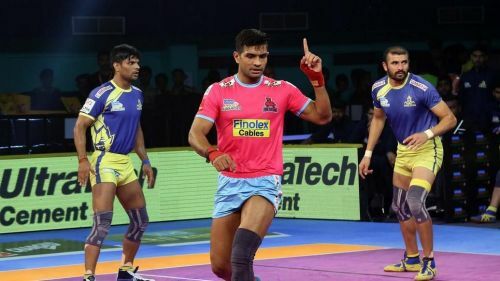 The first Pro Kabaddi League 2018 match held at the Rajiv Gandhi Indoor Stadium, Vizag on Sunday saw Ajay Thakur's Tamil Thalaivas take on the Jaipur Pink Panthers. While Jaipur sit at the bottom of Zone A, the Thalaivas are only above UP Yoddhas in Zone B. This match was a part of the Interzone Challenge Week. Though on paper, the odds could be seen in the favour of Tamil Thalaivas, the result at the end of 40 minutes, said some other story altogether. The first points of the match were scored by the Tamil Thalaivas raider Jasvir Singh, when he scored a bonus in a raid. Jaipur leveled the score immediately, scoring a touch point on all-rounder Manjeet Chillar. By the end of the first 4 minutes, the score was 2-2. The match turned in Jaipur's favour only in the 17th minute, when Deepak Nivas Hooda executed a big super raid to inflict the first all-out of the evening. This helped the already leading Pink Panthers extend their lead from 11-8 to 16-8. The first half ended with Jaipur Pink Panthers all over the Tamil Thalaivas, comfortably sitting at 17 points to 10 of the Thalaivas. The second half started with Jaipur defenders succeeding in tackling Ajay Thakur. In a must-win game for the Pink Panthers, they were playing exceptionally well in both departments. Soon after having a 7-point lead over the Thalaivas, came another super raid from the Jaipur captain Deepak Hooda, and Tamil Thalaivas were all out for the second time in the match. Now the Pink Panthers led the Tamil Thalaivas 26-16. It seemed like the team from south was going down very badly against the Season 1 champions. This match was a must-win for them as well. However, with Jaipur in the pilot seat, the chances of Tamil Thalaivas getting into the playoffs kept getting thinner with every raid. The final whistle was not far now, and only some miracle could have helped the Tamil Thalaivas. But Jaipur were too reluctant to give anything away. Though Tamil Thalaivas succeeded in scoring 8 points after getting all out the second time, the Panthers had scored 11 by then. At the end of 40 minutes, the scoreline read 37-24 in Jaipur's favour, keeping them alive in the playoffs race. Although this match has kept them alive in Zone A, they need to continue this form, and keep their winning momentum intact, as almost all their matches hereafter will be do-or-die matches. Only winning all the coming matches can give Jaipur a genuine chance to get into the knock-out stages. As for the Tamil Thalaivas, it gets much harder from here on.